This week I give a reprise of the very first blog I wrote for this site. Enjoy! 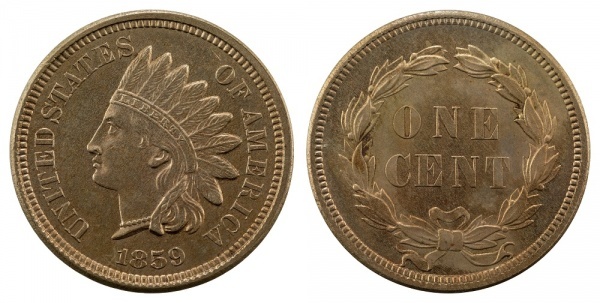 1859 Indian Head cent (wreath). Hover to zoom. Federal coins ranging from the Indian cent to the Liberty Head double eagle. 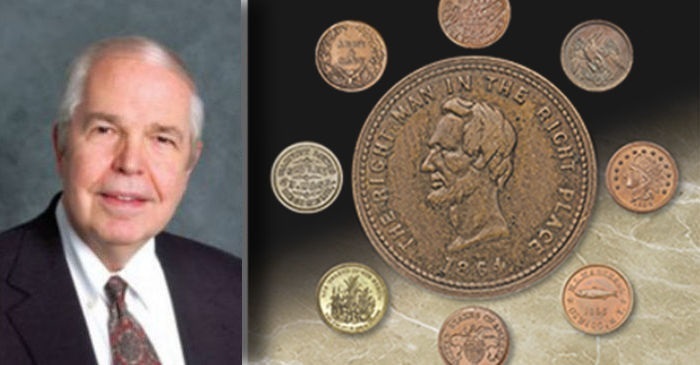 Denominations in copper and silver are easily enough obtained, plus the first nickel alloy coin, the three-cent piece of 1865. Gold coins include the $1, $2.50, $3, $5, $10, and $20, and can be a bit expensive. Federal paper money includes Postage currency and fractional currency notes of denominations from three cents to 50 cents. One denomination of each of the two series would make a nice display. 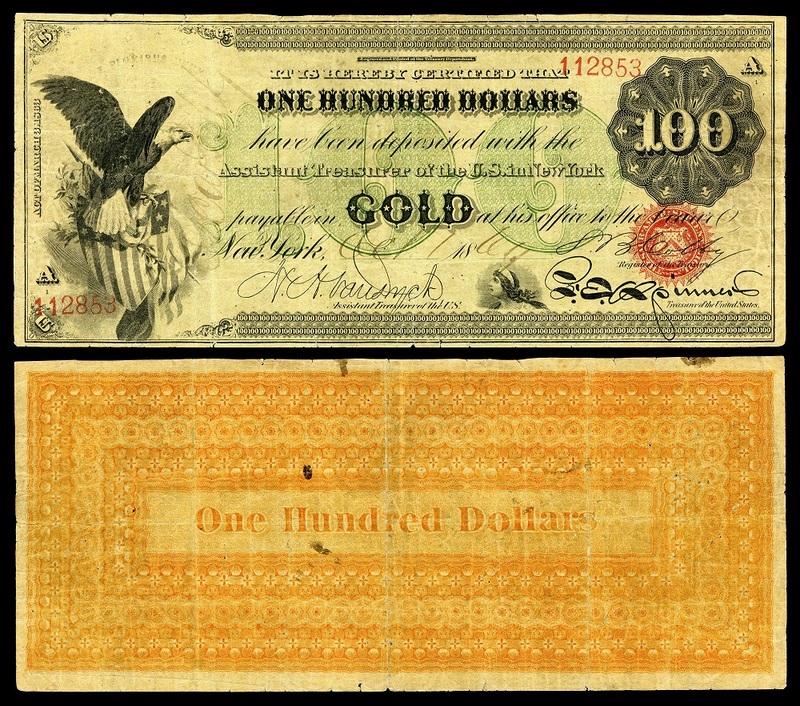 $100 Gold Certificate, series of 1865. For a type set of regular currency, perhaps a single representative note such as a Legal Tender bill of 1862 would suffice. Beyond that, there are many possibilities, some very expensive, including various interest-paying series, Gold Certificates, and National Bank notes. 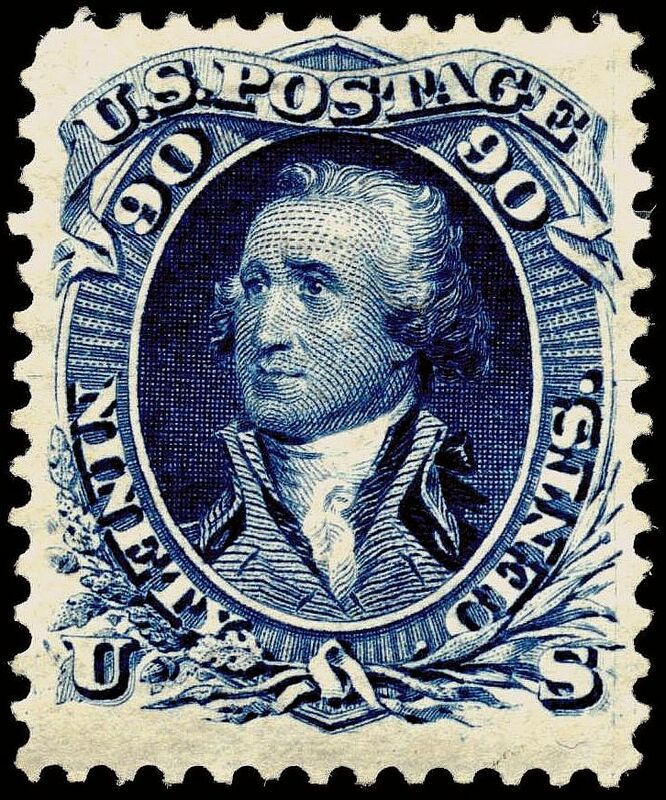 1861 U.S. Postage stamp: General Washington, 90 cents. Encased postage stamps were issued beginning in the summer of 1862 by over 30 merchants. These consist of a brass frame with mica front, under which a regular postage stamp of a value from one cent to 90 cents was placed. These circulated at the value of the stamp and are widely collected today. A representative inexpensive issue would fill the bill. These are in two main classes. 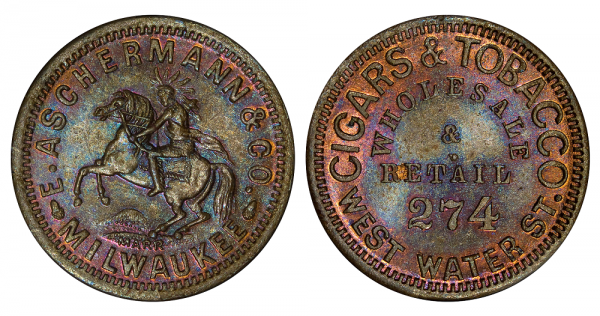 Civil War tokens were issued by private interests and have patriotic motifs as well as merchants’ advertisements. A set could include one example in each category. These are very inexpensive, and in grades such as Extremely Fine to lower Mint State ranges, can cost less than $100 each. A bit scarcer as a class are sutler tokens, issued by merchants who had licenses to travel with military troops and to operate stores selling clothing, games, books, and other items. These generally range into low three figures. A set of one each of just the basic categories, excluding rarities, would certainly make a nice exhibit at a coin show. In practice, most collectors of Civil War items are specialists. Those who collect Civil War store cards issued by nearly 1,000 different merchants are not likely to collect gold coins of the Civil War, and those collecting National Bank notes are not likely to collect encased postage. The entire field is interesting and is worth investigating. Money and history come together very nicely. Hello,my Dad gave me some blue books that are ninety percent filled….they date from1916 to 1945 Mercury head dime…1909 to 1940 Lincoln head cent…Roosevelt dime collection starting 1946…Washington head quarter collection 1932 to1945…liberty standing half dollar collection 1937 to 1947…Lincoln head cent collection 1941 number two….washingtonhead quarter collection 1946 to 1959….Jefferson nickel collection 1938 to 1961 number one…it also includes the handbook of the United States coins with premium list book seventeenth edition. It is fun looking and reading about the coins but I have not any ideas about value. I live in Ludlow Ma…and do not know of any reputable dealers in my area. Would so much enjoy sitting down with someone and learning of the coins.